Wild Dog pursues a villain through the streets, but is stopped by the Green Arrow. Oliver drops a note telling Wild Dog to meet the next day. At the lair, Oliver, Felicity and Curtis debated what they should do. Oliver made it clear to the two of them that they would all be wearing masks to conceal their identities. This did not sit well with Felicity, who decided to ignore Oliver's request. When the team forms, Wild Dog tries to leave, but Oliver successfully manages to get him to stay. Oliver and Thea had a meeting about a medical plan. It was approved. Thea then decided to get her own team to help in the office. After one of the members of the company is murdered by the new villain, the other decides to pull out of the medical plan. Oliver promises that he can increase security for the event and it goes ahead. He reluctantly brought the new team in on the plan, but had to switch between identities at the event. When Mad Dog tries to go after the killer, it gave the team a lead. However, Oliver was less than impressed and went full scale crazy at the team. When Oliver finally decided he needed them, Evelyn and Wild Dog quite. After that, Curtis revealed that he was shocked about the way Oliver treated everyone and quit the team. This put Oliver back to square one and having to take care of everything. Thea went to see the lady from Amertech, but was shocked to find her meeting up with Tobias and them planning something. Thea took to the news to Oliver, but Felicity appeared and said the company are close to bankruptcy. Oliver then decides to go it alone and save the day. Tobias then realized he could save $100 Million by letting the woman die. 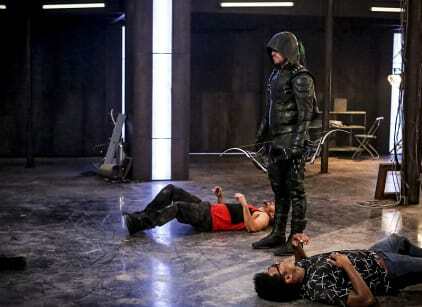 Oliver recruits team arrow to help. So, wait, there's training? I'm out. Permalink: So, wait, there's training? I'm out. It's really sweet you think that I can be replaced. Permalink: It's really sweet you think that I can be replaced. Arrow Round Table: What Will Become of the Recruits?